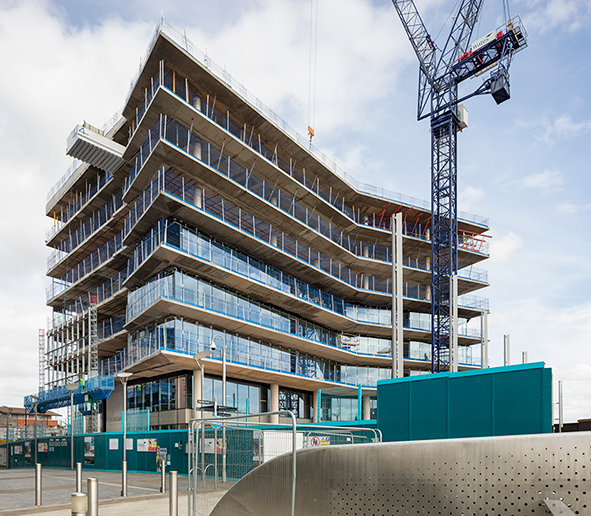 Following a topping out ceremony in April to mark further progress, Wakemans reports that 3 Glass Wharf, Bristol’s premier office development, is on track for completion by the end of the year. Wakemans is acting as employer’s agent, quantity surveyor and CDM consultant on the £30 million development – one of the most important schemes of its type in the South West – on behalf of developer Salmon Harvester Properties. 3 Glass Wharf is located in the Temple Quarter Enterprise Zone and will be occupied by one of the 13 teams that HM Revenue & Customs (HMRC) is setting up as part of its regional centres programme. Commanding a prime city centre location close to Temple Meads railway station, the building comprises 15,000 sq m of Category A office space across seven storeys plus a basement with secure parking for cars and cycles as well as separate showers and a locker room. John Woodhall, executive chairman and joint managing director at Wakemans, said: “Situated adjacent to Salmon’s highly successful Glass Wharf 2 scheme, 3 Glass Wharf is another major development that reflects the changing character of Bristol’s city centre thanks to the ongoing rejuvenation of the old docks. 3 Glass Wharf is being built by Wates Construction on a brownfield site that was previously home to a glassworks and the 100-week build programme is progressing on schedule. The building’s design reflects its former use, with glass facades, floor to ceiling glazing and frameless glass balustrades affording panoramic views over the Brunel floating harbour. A feature glass artwork designed by artist Terry Haggerty will grace the Harbour Wharf elevation of the building façade overlooking the harbour and railway. In a major restructuring programme due to be completed in 2025, HMRC is closing a number of its offices and investing in 13 new regional centres. 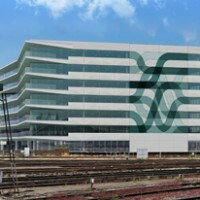 By choosing to base one of its teams at 3 Glass Wharf, HMRC is not only signalling its intention to improve services, but is also underlining its commitment to Bristol. Around 1,400 civil servants, relocating from across the South West, are expected to move into the building in 2019.